Yoga has been the wave of the new world as of late, but is not just for the younger generation. There are many benefits and reasons that support why yoga is a great practice for seniors and the elderly population. Staying healthy as we age becomes increasingly difficult with the onset of age-related diseases and life-threatening illnesses. 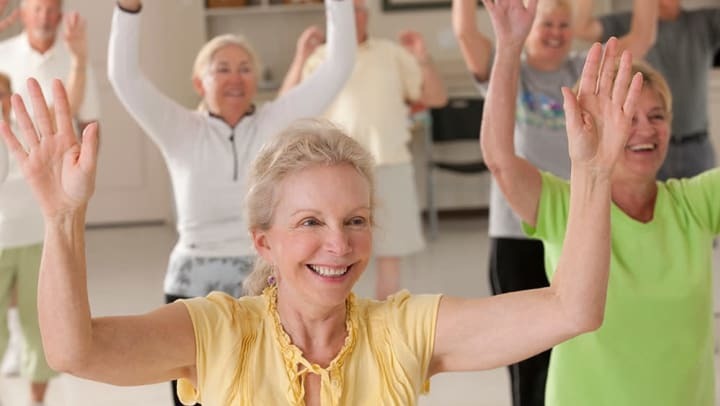 Keeping the weight off and ensuring sound mental and emotional health are of other related concerns in aging, but there are many ways seniors can stay healthy. Of course, we can help alleviate symptoms at the onset of certain illnesses and diseases, as well as keep the weight off with better nutrition and diet practices. Exercise is another great way to supplement those practices, or vice versa. Yoga is a great form of exercise that is an all-encompassing activity for everyone, especially seniors, to live a healthy and full life. As a practice of conscious breath and movement, yoga is founded upon poses that focus on balance and stability, which are important to fine-tune as we age. Falls are one of the biggest concerns as we get older, practicing yoga will help us build greater balance and stability for fall prevention. Through balance and stability exercises in the poses and movement of yoga, we also build muscle and strength through that same process. If a fall were to occur causing injury, it would also aid in the recovery process. The foundation of yoga is breath, which can also scientifically be noted as our respiratory system, and breath is the foundation of life for all humans. Through practice, the breathwork will improve our respiratory system which most often declines or becomes limited with age. Oxygen shortages in the respiratory system can have negative effects on our mind and our body, so this simple breathing practice combined with simple movement and posture, will greatly impact the quality of your overall being. Reducing that oxidative stress can also aid in reducing blood pressure or hypertension, which can lead to cardiovascular disease, and other common concerns for seniors, like the chances of heart attack. Another great benefit of Yoga is support and improvement to our joint health. With practice, increases in flexibility helps loosen our muscles which can cause a lot of joint and muscle pain. Combined with the strength and balance gained from low-impact movements, which also aid in joint health, a third piece -- increased flexibility -- provides those who practice consistently with improved joint health and greater, well-rounded injury prevention. Physiologically, yoga can reduce our sympathetic nervous system, also known as our “fight or flight” system, which causes inflammation on the mind and body. It can also trigger the parasympathetic nervous system, also known as our “rest and digest” system, through slow breathing and mindful movement. This can reduce the byproducts of stress and anxiety that build up from other parts of our lives. As yoga is focused on the marriage of our breath and movement of our bodies, it promotes introspection to be aware of these things as they occur. They come together to form a mindful foundation of practice. You will surely become more self-aware and mindful of thoughts, breath, and movement of your body in practicing yoga.